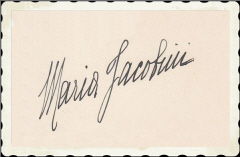 The actress Maria Jacobini began her film career at the Italian silent film, she had her first appearances already in 1910 with the movies "Lucrezia Borgia" (10) and "Beatrice Cenci" (10). She continued acting successfully in Italy in the next years and became a star with movies like "Giovanna d'Arco" (13), "Il filo della vita" (17), "La signora Arlecchino" (18) and "La vergine folla" (19). She experienced the height of her career in the 20's. Besides her Italien movies she was able to gain a foothold in Germany and became also popular ooutside of Italy. To her well-known movies of the 20's belong "Amore rosso" (21), "L'incognita" (22), "Bohème - Künstlerliebe" (23), "Orient - Die Tochter der Wüste" (24), "Beatrice Cenci" (26), "Bigamie" (27), "Die Frauengasse von Algier" (27), "Der lebende Leichnam" (28), "Villa Falconieri" (28) and "Marnan Colibri" (29). She continued her career successfully at the beginning of the 30's with movies like "The Strange Case of District Attorney M" (30), "La Stella del cinema" (31) and "La scala" (31) but afterwards the role offers dropped off. The likeable actress appeared till her early death in movies like "Giuseppe Verdi" (35), "Cento lettere d'amore" (40), "Via delle 5 lune" (42), "La signorina" (42) and "Tempesta sul golfo" (43).